On visiting the website of the Little House on the Prairie Museum lists, it lists the following caveat: “Due to an ongoing error with GPS technology, many GPS navigators and mapping services are unable to direct their users to our site. To avoid becoming hopelessly lost, please use the following directions.” An amusing comment, to be sure – but, surreptitiously or otherwise, an apt description of the life of Laura Ingalls Wilder and her devoted readers. Any reader of the “Little House” series knows that Laura Ingalls was born to a farmer and his wife in search of the American dream: a house and estate on the American Great Plains. Charles and Caroline Ingalls’ peregrinations throughout what would become Wisconsin, Minnesota, Kansas, Iowa, and South Dakota were set in motion by the Homestead Act of 1962. This legislation offered free land to pioneers who were willing to ‘prove’ their claim by building a house, farming five acres, and staying put for five years. While the eastern section of the United States fought the Civil War and argued the place of African-Americans in a ‘reconstructed’ country, the Ingalls, like so many others, sought their own place in the wilderness. It’s important to remember that Charles Ingalls was not a successful pioneer; the travels of his family include accidental infringement on Indian Territory (and indignation at being forced away), and several false starts before finally settling down in the DeSmet, South Dakota, area. While Mary and Laura, the two oldest daughters, were born in Pepin, Wisconsin, Grace was born on the plains of Kansas; son Freddie was born in a dugout house in Minnesota and died in a hotel in Burr Oak, Iowa. (In particular, the Burr Oak days were painful enough that these stories did not ‘make the cut’ into the children’s series.) 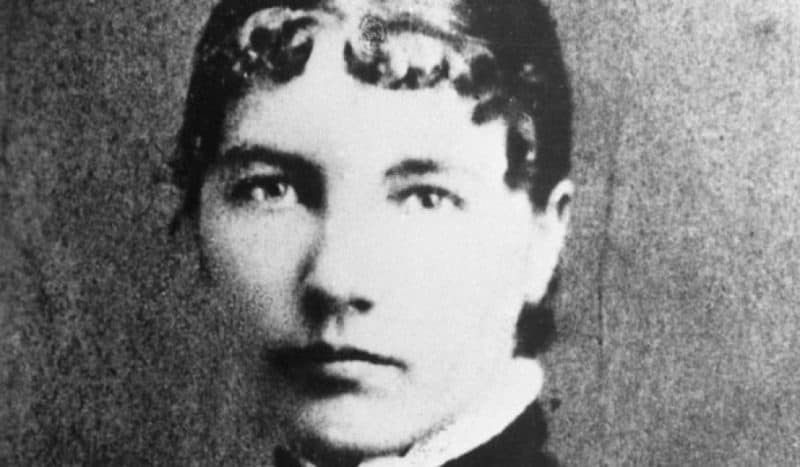 Grace Ingalls was born in Burr Oak right before the family returned to Minnesota. The family arrived in DeSmet two years later, in 1879, right before Mary suffered a form of encephalitis and went blind. By this time, Laura was twelve, she had moved six times in little over a decade. The ‘Little House’ series comprises eight books written from the perspective of a child growing up in a pioneer family. As such, it records a succession of encounters between the Ingalls family and the Native American tribes in the area. In fact, the Ingalls family left Kansas because their settlement was on Osage territory. To a twenty-first century reader, the depiction of Native Americans is demeaning; the character of “Ma” comments many times on her distrust and dislike of the race, and Pa tells Laura that the country now belongs to white people. More than half a century later, the adult writer recorded these comments in books written for children. It must be remembered that the Ingalls family were participants in the doctrine of Manifest Destiny, and that the Wilders, in the throes of the Depression, lived in a Southern state that participated in segregation. Thus, she told her story from a viewpoint that we now find reprehensible but was common during her lifespan. History and Laura Ingalls Wilder would collide many times during her life; the winter of 1880-81 is yet another example. Recent reviews of NOAA information for the upper Plains area during that season authenticate Wilder’s recollections, recording a mid-October blizzard followed by seven months of snow. In April of 1881, the area experienced significant flooding as a result of snowmelt. Like the locust attacks in Minnesota, the storms challenged and endangered pioneers. The rosy picture painted by the series was in fact a gloss on the harsh conditions endured by settlers in the area who only dimly understood the environment as they attempted to raise crops using methods borrowed from a different eco-system. Today, the very few who attempt to farm on the Great Plains experience similar austerity, only without the threat of Native Americans trying vainly to hold onto their ancestral lands. After finishing Those Happy Golden Years, the seventh book in the series and the last to be published in Wilder’s lifetime, the reader is left with the perception that Laura and her husband continued to live an idealized existence. Actually, nothing could be further from the truth. Growing up in a peripatetic pioneer family was much harder than the books suggested, and adult life would prove to be equally difficult. Laura left her childhood at the age of fifteen, when she was granted a teaching certificate. She taught for three years in order to financially assist her parents. Mary, who would never marry nor live on her own, was able to attend the Iowa Braille and Sight Saving School in Vinton thanks to Laura’s contributions; while teaching, Laura stayed with a family twelve miles outside of DeSmet. Almanzo Wilder drove her back and forth during this time; what began as a favor swiftly grew into a courtship. Married in 1885 at the age of eighteen, Laura found adult life difficult. She gave birth to her only surviving child fifteen months later, after losing their first year’s crops to hail. Three years later, after enduring diphtheria while pregnant, she gave birth to a son who died soon afterwards. Almanzo also contracted the disease, which left him permanently partially paralyzed. A year later, their house burned to the ground, and the Wilders began moving around in a way that echoed those of her parents. The three surviving Wilders first moved to Spring Valley, Minnesota, to live with Almanzo’s parents. The severe winters of the upper Plains, however, were detrimental to Almanzo’s fragile health, and in 1891 family moved to Westville, Florida. There, Laura found she could not contend with the humidity and heat; the three returned to DeSmet in 1892. For two years, Laura’s life echoed that of her parents’ during the Burr Oak years; Almanzo worked as a carpenter and Laura as a dressmaker in order to save up enough money to again buy a farm. In 1894, they had enough to make the move. Laura was twenty-seven when she left DeSmet for the last time; she would live for another sixty-three years in Mansfield, Missouri, in a climate that suited both her and her husband. Raised on a series of farms, Laura and Almanzo both turned initially to farm work to support their family. They bought land outside of town, although they were not able to live on their property for fifteen more years. Almanzo sold firewood and Laura raised chickens as they worked to ‘improve’ their land. Having learned from their experiences in South Dakota, they diversified their farm crops, planting an orchard and nurturing milk cows to begin a dairy. From a nearly penniless start, the two were able to support themselves and raise their daughter, who grew up to be a free spirit and an independent woman. From all accounts, Laura and Rose were never ‘kindred spirits’; they had very different personalities, and Rose’s early years coincided with too many difficult circumstances for Laura to be a fully devoted parent. While the relationship endured many strains, however, the two were close enough to share their common interest in the written word. Rose was to be the first author in the family, living on her own and earning a living as a telegrapher. True to her upbringing, she married but continued to supplement the family income, this time with gigs as a newspaper reporter. Living a nomadic life until her divorce, she began to freelance; while her parents were developing their land in Missouri, Rose lived in California and worked as a journalist. Her career would eventually impact that of her mother’s. On the road from South Dakota to Missouri, Laura kept notes of the journey, and wrote them up for an account published in the DeSmet newspaper (later turned into the book On the Way Home, published posthumously in 1962.) While her first decade in Missouri was devoted to developing Rocky Ridge Farm, her experiences there caused her to become known in the state as a knowledgeable poultry farmer; she gave speeches in several places which impressed listeners with her considerable farming acumen. Following one such address, she was offered the opportunity to write an article for the Missouri Ruralist, which turned into a regular column entitled “As a Farm Woman Thinks.” Her work with this paper continued into the mid 1920’s. Around 1910, Rose Wilder Lane first encouraged her mother to write about her childhood experiences as a pioneer. Having lost her father in 1902, Laura grieved the death of her mother in 1924 and that of her sister Mary in 1928; these bereavements no doubt furthered the desire to pursue the genre of memoir in addition to her journalist writings. By the end of the 1920’s, Laura completed a book-length work entitled “Pioneer Girl”, which was sent out to publishers but received no offers. When Rose returned to Missouri in 1928, the two began to work together on revising Laura’s story, eventually making the momentous decision to re-cast the stories into a series of children’s books. American historical events would once again impact the lives of Laura and her family members. In 1929, the New York Stock Exchange crashed. Laura and Almanzo lost most of their savings, as did Rose. By now, Laura was sixty-five; Almanzo a decade older. The family had the land to live on, but little else besides memories. Yet, in a triumph of re-invention, Laura and Rose focused on the pioneer stories, eventually finishing a book entitled Little House in the Big Woods. Harper would publish it in 1932. There is no doubt that the Depression was instrumental in making Laura’s book so popular. The series of events that would come to collectively be called the Great Depression was a world-wide cataclysm that forever changed the economic history of the United States. At its peak, one out of every four Americans was unemployed, and the country would not fully recover until the start of World War II, when munitions, Lend-Lease, and the needs of a country attacked on two fronts led to an unprecedented need for manufacturing. Before Pearl Harbor, however, people longed for respite from the unyielding grimness of financial and food insecurity. With every penny accounted for, the population of the United States found the nickels needed to flock to movie theatres. Radios were saved up for and purchased; beyond Roosevelt’s “Fireside Chats,” on-going serials and other audio programs became popular sources of entertainment. Given the need for entertainment, it’s not surprising that a series of recollections from what appeared to be a simpler time gained status and fame. Little House in the Big Woods was an immediate hit. Farmer Boy, the story of Almanzo’s childhood, followed it a year later, in 1933; Little House on the Prairie in 1935, By the Banks of Plum Creek in 1937, and By the Shores of Silver Lake in 1939. Central to the series’ popularity was certainly the image of the self-sufficient pioneer, melting down lead at night to create bullets to use in the search for food on the morrow. The books encouraged Americans to live with moral simplicity and make do with what they had. To a population reeling from urban poverty and its attendant woes, the idea that money could be unimportant was tremendously appealing; victims of the Dust Bowl and those with relatives ‘riding the rails’ in search for soup kitchens and jobs were soothed by nostalgia for open land and new horizons. Because they were written with children in mind, the stories were idealized; while the grit of pioneer life was preserved, the grim aspects were glossed over or left out entirely. The Ingalls’ years in Burr Oak, Iowa, never made it into the series, nor did the life and death of Freddy Ingalls, Laura’s little brother. What remained was the idea of the happy pioneer family, brave and indomitable together. As war clouds gathered and World War II began, Laura turned to storm clouds with the publication of The Long Winter in 1940 and to idealized American life with Little Town on the Prairie and Those Happy Golden Years in 1941 and 1943, By now, Laura was in her seventies, and her politics were again understandable for her time but controversial three-quarters of a century later; having opposed the New Deal a decade earlier, she was not now in favor of United States intervention in international affairs. Family tragedies, however, once again drew her attention away from the national stage. Grace Ingalls Dow died in 1941 of complications from diabetes, and Carrie Ingalls Swanzey from the same illness in 1946. Three years later, though thought to be recovering from a severe illness, Almanzo died of a heart attack at the age of ninety-two. Laura would outlive him by eight years, dying at the age of 90 in 1957. Research on Laura Ingalls Wilder and Rose Wilder Lane is divided on how much of the series was written by the latter; it’s known that she took an active role in editing the books, but critics disagree on whether or not she should be considered a co-writer. After Laura’s death, Rose had her final works, On The Way Home and The First Four Years, published respectively in 1962 and 1971; while popular with devotees to the “Little House” canon, these never received the same attention garnered to the first eight. On The Way Home was an account of the move from DeSmet to Missouri, and as such lacked many of the characters that made the earlier works so memorable; The First Four Years was felt to lack the simplicity and spirit of the other “Little House” books. Like the Westerns that filled movie screens during the heyday of Hollywood, Laura Ingalls Wilder and Rose Wilder Lane can be credited for the romanticism associated with Western Expansion, and, some aver, for the mythos of the independent pioneer and his self-abnegating, thrifty wife. Many are now appalled at the ways in which Native Americans are characterized. At the same time, however, the modest tales narrated therein introduce children to a past which should be remembered as a part of American history. Taught in many elementary schools, they are considered essential reading for American children. Today, the books remain popular, and the “Little House” tourist trail consists of the sites where the Ingalls family lived and worked. A television show based on the series began in 1974 and ran for a decade. In 1993, the United States Post Office issued a commemorative postage stamp which honored the “Little House” books as part of the top ten classics of children’s literature. The books have sold close to fifty million copies and have been translated into forty different languages. They are unique in their detail, beautiful in their characterization of a close family battling the elements, and thrilling in their evocation of unspoiled territory. Whether we remember Laura Ingalls Wilder fondly or not so fondly, there is no doubt of her place as a writer in the pantheon of American letters. In our love and criticism of her values, we demonstrate our relationship to that era and its importance in our national consciousness. Baker, Maggie Koerth. “The Meterology of ‘Little House On the Prairie.’ “ Boing Boing, December 11, 2012. Accessed 4 April 2017. Brammer, Rebecca, and Greetham, Phil. Laura Ingalls Wilder: Frontier Girl, 2008. Accessed on 24 March 2017. Eschner, Kat. “The Little House on the Prairie Was Built on Native American Land.” Smithsonian.com, February 8, 2017. Accessed 4 April, 2017. “Historic Locations and Points of Interest.” Little House on the Prairie, 2013-2017. Accessed 4 April 2017. “Laura Ingalls Wilder.” A&E Television Network, nd. Accessed 24 March 2017. “Laura Ingalls Wilder.” DeSmet, South Dakota: The Wilder Life. DeSmet Development Corporation, 2017. Accessed 24 March 2017. “Laura Ingalls Wilder Biography.” Encyclopedia of World Biography. Advameg, 2017. Accessed on 22 March 2017. “Laura Ingalls Wilder (1867-1957)”. Historic Missourians. Missouri State Historical Society, n.d. Accessed on 24 March 2017. “Laura’s Life on Rocky Ridge Farm.” Laura Ingalls Wilder Historic Home and Museum, 2013. Accessed on 4 April, 2017. Little House on the Prairie Museum, Independence, Kansas, 2017. Accessed 5 April, 2017. “Laura Ingalls Wilder: Historic Homes.” Laura Ingalls Wilder Historical Society, n.d. Accessed on 24 March, 2017. “Laura Ingalls Wilder Home.” Laura Ingalls Wilder Historic Home and Museum, 2013. Accessed on 24 March 2017. ” ‘Little House’ Still Resonates After 75 Years.” USA Today, May 27, 2007. Accessed 7 April 2017. “The Long Winter of 1880-81.” Black Hills Pioneer, 31 January 2017. Accessed 4 April 2017. “Ma Ingalls Describes Family Life in 1861.” Wisconsin Historical Society, 2017. Accessed 24 March 2017. “Rose Wilder Lane and Laura Ingalls Wilder.” Herbert Hoover Presidential Library and Museum, n.d. Accessed 24 March 2017. Thurman, Judith. “Wilder Women: The Mother and Daughter Behind the Little House Series.” The New Yorker, 2009. Accessed 7 April, 2017. Vergano, Dan. ” ‘Little House’ Author Right on 1880’s Winter.” USA Today, August 21, 2011. Accessed 4 April, 2017.